Our wines give voice to the language of Sangiovese: they represent a most authentic expression of the Sangiovese grape in its Chianti declination. Piemaggio's wines flawlessly embody the best features of this complex territory, where wines of great character and balance come to life. The painstaking work in the vineyards, the selection of the best grapes at harvest time, together with vinification and ageing techniques that fully respect the nature of the grapes: all these factors result in top-quality wines of great honesty. This wine, a blend of 90% di Sangiovese and 10% between Colorino, Canaiolo and Ciliegiolo, is the epitome of the archetypal Chianti Classico from Castellina in Chianti. 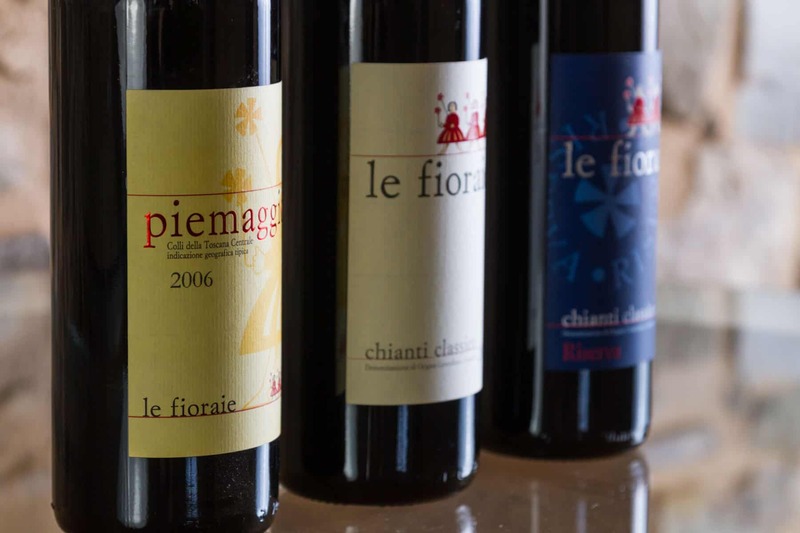 The name Le Fioraie on the label refers to the location where all the vineyards of the Piemaggio estate are situated. A Chianti Classico of great character and elegance, this wine expresses the uniqueness of Piemaggio wines at their best. Soil composition: Alberese and galestro, typical soils of the Chianti Classico area. Vinification: Traditional in red with controlled temperature in steel vats, with skin maceration for around 25 days, pumping overs and delestages. Ageing: : around 18 months, with passages from concrete vats to 25HL French oak casks and finally tonneaux. Tasting notes: This wine is the most authentic expression of a typical Chianti Classico, of intense ruby colour that acquires burgundy undertones with ageing. Pleasant notes of violet flowers and dry cherry on the nose, intense and persistent taste. Serve with: Pasta dishes, typical Tuscan cold cuts, roasted meats and semi dried cheeses. This wine is only produced on the best vintage years, from Sangiovese grapes, carefully selected at the time of the harvest, and a small part of Colorino, Canaiolo and Ciliegiolo. The south-south-westerly aspect of the vineyards, the altitude between 380 and 480mt, and the complexity of the soil, mostly composed of galestro and Alberese, together bring to life a wine of excellent structure, elegance and balance, the perfect embodiment of the best qualities of its territory. Appellation: Chianti Classico Riserva D.O.C.G. Cultivation technique: Guyot. Green harvest and grape selection. Manual harvest, selecting the best grapes within a site that fits the purpose very well in terms of aspect and soil composition. Ageing: : around 36 months, with passages from concrete vats to 25HL French oak casks and finally tonneaux. Tasting notes:This wine is only produced in the best vintage years. On the nose it's inense, elegant and persistent with hints of berries and vioets. On the palate, it has an has intense structure and elegance with a great balance between tannins and acidity. Serve with: Read meat, stews and old cheese. This wine represents a modern interpretation of a blend of Sangiovese, Cabernet Sauvignon and Merlot. It's a direct homage to the name of the main farmhouse where everything began. The first vintage of Piemaggio IGT was 1996. This wine was created with the intention of highlighting even further the structure and potential of the Sangiovese grape by blending it with the Merlot and Cabernet Sauvignon grown in the Castellina in Chianti area. An extremely complex wine, of great elegance and longevity. Vinification: Traditional in red with controlled temperature in steel vats, with skin maceration for around 25 days , pumping overs and delestages. Tasting notes: This wine is our modern interpretation of a blend of Sangiovese, Merlot and Cabernet Sauvignon. The colour is an intense ruby. On the nose, this wine is elegant and persistent with hints of plum, sour cherry, tobacco, liquorice and vanilla. A wine of great balance, soft tannins and good structure. Serve with: Pasta dishes with mushroom sauces, roast and grilled meat, dry, cured and ripe cheese.